Charles Leverone coached cross country and track for over 40 years. 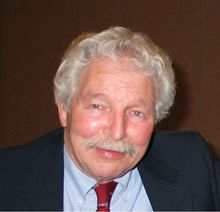 Charles Leverone was a distinguished member of the Rockland Bulldog community. As a coach and teacher at Rockland for over 40 years, Leverone was a vital part in Rockland’s rise to success in track & field and cross country. He is also an honorary member of the Rockland High School Athletic Hall of Fame. Leverone died on Feb. 3 of this year after a brief battle with cancer in his Hanson home with his family by his side. From the outset, Leverone was a magnificently gifted athlete, starring at Arlington High School, Huntington Prep and UMASS Amherst. A relative of two-time Boston Marathon winner Johnny Kelley, Leverone always had a passion for athletics, especially running. While at UMASS, Leverone lettered 14 times, a UMASS record and is in the UMASS Athletic Hall of Fame even though his career was interrupted by his service in the Korean War. Upon graduation from UMASS, he became a science teacher at Rockland High in 1961. He served as a teacher of anatomy, physiology, biology, and physical education at RHS until 1991. Leverone continued to help out with cross country and track after his official retirement as a coach at RHS. “He always used to say ‘run like you stole something,’’ Deseroche added. Leverone also coached at Scituate, Norwell and Sacred Heart High School, as well as Boston University. Among his most distinguished honors was being named the first and only assistant coach to be named “Coach of the Year” by the Boston Globe. In a ten-year span from 1992 to 2002 while coaching Scituate High School’s Girls Track and Field team, he amassed a stunning record of 74-3-1. RHS Athletic Director Gary Graziano recently announced the establishment of two awards dedicated to Leverone to be given at the senior athletic banquet in May. “These will be for the top male and female runners in cross country or track,” said Graziano. In over 40 years of teaching and coaching at Rockland High, Charles “The Great” Leverone touched the lives of his students and runners. He did anything in his power to make them all better athletes, students, and citizens. This goal had the same result as just about everything Charles Leverone did, victory.